Large businesses and corporations have come to rely heavily on digital marketing to reach their consumers. Social media, blogs and, of course, the almighty app, are used constantly to communicate, share, advertise, and relate to the public. But, are small businesses investing in apps? Our 2015 Small Business Digital Marketing Survey was designed to examine just that question and to explore motivating factors for small businesses to build apps. We asked more than 350 small business owners to share with us about their use of apps for marketing and sales. Below the infographic are the full details of our results along with commentary from experts in small business mobile app development. Mobile apps are a unique and fresh way to connect with consumers. A company's app allows regular communication with loyal customers through things like push notifications. It also allows consumers to access contact information, e-commerce pages and coupons or deals quickly and easily, anywhere and anytime. "2014 was proclaimed "The Year of Mobile" and, for the first time, saw mobile usage surpass desktop usage, making up 60 percent of time spent accessing digital media (Comscore, 2014). Of that, 80 percent of mobile time is spent in an app – not surfing the mobile web, as many would think (Flurry, 2014). Consumers are using mobile apps to research locations to shop, eat, play and relax – and it's up to businesses to be where their audience is. Most businesses understand that a mobile-friendly or responsive website is imperative to their business, but many still lag behind adopting a mobile app strategy." The question remains: "Who is lagging and why?" Although mobile apps have been embraced by larger companies, there seems to be a lag in the small business world. Our first question cut to the chase: "Do you have a mobile application?" 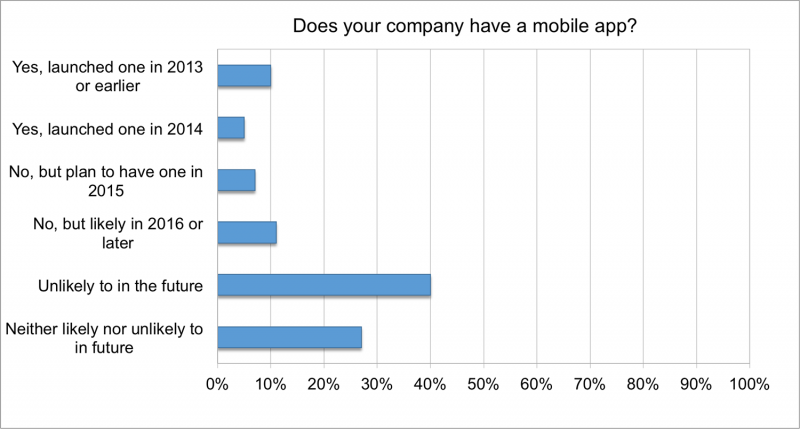 The results show that 15 percent of small businesses currently have a mobile app. Of those with an app, one-third launched their app in 2014. An additional 7 percent plan to build an app in 2015, and 11 percent believe a mobile app is a likely part of their digital marketing strategy for the future. However, 40 percent stated they are unlikely to have an app in the future and another 27 percent are uncertain. We also organized our findings into two groups: businesses with fewer than 10 employees and businesses with a workforce of 11 to 500 people. Perhaps not surprisingly, we found that the fewer employees that a company had, the less interest they seem to have in developing a mobile app. Bobby Gill, founder and CTO of app development company Blue Label Labs, was not surprised by these results. "It sounds like people are still not sold on the value a mobile app might provide to a small business. As an app developer, that's obviously not hugely promising but I don't think it's negative. I think people are rightly kind of skeptical, if you're a small business owner, in terms of the return on investment from a mobile app, especially considering it's been seven or eight years now that we've had the App Store. So, I think a lot of the gloss and shine of, 'I need to have an app,' might have worn off and people are being more realistic." On a more optimistic note, McLandress describes options for small business owners to get started with mobile. "There is still hesitation about mobile apps, primarily because many businesses don't realize that a native app isn't another mobile version of their site, but a stream-lined, experience-driven environment. Aside from misunderstanding the benefits of an app, there are also fears over the lack of technical knowledge or budget to support such a project. However, these fears are no longer founded as do-it-yourself (DIY) tools, like AppsBuilder, are available to help any business build their own iOS or Android app on a budget that anyone can afford." Shira Anderson, marketing manager at DIY mobile app solution company Como, described a shift taking place in which mobile apps are becoming more salient and accessible to small businesses. "There's been a real shift in the last five years in terms of what mobile apps are and what they can do for you, and we're only now beginning to see that bear fruit for businesses big and small. If you think about the really successful business apps out there, there still aren't a lot. But recently, businesses have begun to understand how to implement mobile technology in a more effective way. Of course, the app that has really transformed the entire concept of a “business” mobile app is Starbucks. Though it was the early adopter, we're increasingly seeing big enterprise companies introduce their own apps. They are basically creating a new channel for communication; something that heralds a whole new level of engagement that's specifically tailored for the mobile experience. As we see those examples play out on the enterprise level, that trickles down to small businesses. If you are a Starbucks customer and you have their app on your phone, the more you use it the more you intuitively understand how an app might work for you as a business owner. Today we see the beginnings of that change; this will continue to change much more." The top reason for building a mobile app is customer service, indicated by 76 percent of small businesses with apps. To increase sales and to be competitive in the market were roughly equally motivating factors, at 37 percent and 35 percent, respectively. Vasily Malyshev, founder and CEO of app development company Messapps, noted how all of these reasons lead back to one root motivation – to increase revenue. "I would certainly agree with those reasons. However, I also think that those reasons are very closely related. The main goal of any business is to make profit – lots of it. Other reasons are just ways of getting there. For example, improving customer service or experience is aimed at getting more loyal customers, which transforms into higher sales. Similarly, being competitive in the market I think almost by definition means that you attract enough customers to make a solid income." "The chart speaks for itself: the main reason why small and medium enterprises (SMEs) build apps is to improve customer experience. This decision is driven primarily by two reasons: users evolve, becoming more demanding, savvy, and time poor, which means businesses need to adapt as well and learn to "be where their customers are". Secondly, mobile apps allow businesses to contact and engage audiences exactly in the moment they need it most, wherever they are, directly on their phone." Richard Jones, partner and CCO at DIY mobile app builder Appsmakerstore, described three primary reasons why small businesses should consider having a mobile app. "Mobile apps provide a new channel of sales for small businesses, something that's actually going to allow their customers to purchase their products and services using their smartphone wherever they are. Secondly, an app can provide businesses with productivity and process savings. Instead of having customers, say in a hair salon or a restaurant, calling during working hours and asking to book a table or book an appointment, they can use an app to do that. Then, over and above that is to complement it with more effective and personal marketing, through push notifications, loyalty stamps that reward repeat customers, or personalized messaging using the GPS in smartphones and tablets. Apps aren't just games, they aren't just shallow marketing devices. They actually provide sort of a holy trinity of benefits for small businesses: increased sales, improved productivity, and more effective and personal location-based marketing campaigns." Other specific motivations for businesses to have an app include the opportunity to have a direct line of communication with loyal customers and to provide a high-performance, native shopping experience. Jason Jaynes is the co-founder and CTO at Apptive, a DIY app development platform specifically for mobile commerce businesses. He elaborates on these reasons. "A lot of our customers say, 'We want another communication channel that we have more control over to reach out and touch our customers.' I'll give you a great example. We have a customer that had built up a very loyal following on Facebook, and had tens of thousands of users that were following them. That was their primary communication channel, up until the point when Facebook changed their strategy and algorithm for how customers could be reached. Immediately, these guys fell overnight. Their reach dropped to a much smaller percentage. So, they wanted an app to in order to build up a channel where they get users who have identified themselves as being loyal to install the app, and then use the push notifications to reach out to them. They can do that in a way that's completely free of any third party. The other thing is, they like to take advantage of the value of having the native app to improve the overall shopping experience. So, if I am a loyal customer and I'm a repeat visitor, it's much easier for me to click on an icon in my app, launch directly into the shopping experience, browse products, and find things, and I'm not surrounded by a bunch of additional headers and footers, and like this, and like that. I can just start into the shopping experience, and the overall speed and performance of the shopping experience is improved because it's native versus going through a traditional mobile website technology." We now understand the motivations behind building an app for small businesses, and the types of benefits apps can bring. But, what other information can we garner about the 15 percent of small businesses that have already chosen to develop apps? Jones describes his customers as busy and customer-focused. Having an app to take on tasks such as reservations can free up time for time-pressed business owners to focus on what's important. "It's everything from a small shop, for example, with one or two employees, whether that's a marketing consultant, or a handyman, or a mobile hairdresser. These guys need to make sure that they can take bookings, reservations, and communication from customers without having to constantly answer the phone or emails. Apps can work for all businesses of all sizes, because, at the end of the day, they all have the same pain points around making sure they are accessible to their customers, giving their customers exactly what they want, and doing it in a way that is both profitable and a great experience for the customer so that they come back again and again." McLandress emphasized that those who have already built apps are typically on the forefront of digital marketing in many areas of their business. She further explained how small businesses ideally approach having a mobile app. "Our clients come from all types of sectors, from family-run bars and fitness instructors to real estate brokers and event planners. However, one thing that remains a constant is an understanding of digital marketing. Many of our small business customers have curated their web presence, adopted mobile-friendly design, and are now looking for new ways to stay on their customer's smartphone. In mobile, there's pressure to be innovative, but for many businesses it can be counterproductive to focus on being cutting edge. Instead, what they actually need to focus on is building a mobile app that is 'tried, tested and true' and can be customized for their brand. That's where standard templates and customizable features can really help a business. By eliminating technical or usability concerns, marketers can focus on their mobile business and on being competitive in a mobile-first world." 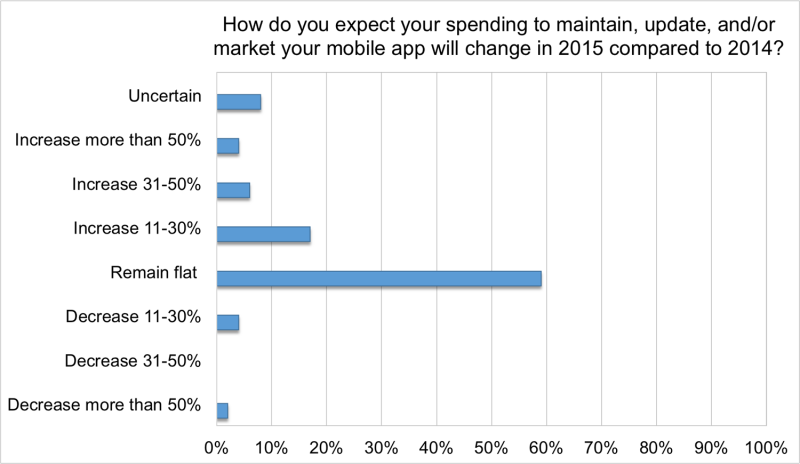 How Will Small Business Mobile App Spending Change in 2015? Next, we investigated whether those who already have an app plan to increase their investment in it in 2015, and if so, what they'll be spending more money on. 59 percent of the small businesses we surveyed said that their mobile app budget would not change in 2015. For those with DIY platforms, this makes sense because their monthly fee remains flat. 27 percent plan to increase their mobile app spending in 2015. We asked the experts what types of features and upgrades might warrant an increased mobile app budget in 2015. Jaynes noted two main areas where mobile commerce businesses are increasing their investment. "We're seeing spending increases specifically in two areas. One area is for our customers that have been with the platform for a while and are looking for a little bit more control and customization of the upfront shopping experience. So, when the user comes into the application, what do they first see? What products are they being introduced to? We'll sit down and work directly with the customer for a one-time fee, to help them to build a customized store home page and navigation experience in the app. The other area is just a natural progression, where our customers are saying, 'How do we get more out of our app? We've got 500 people who have downloaded it. What are ways we can leverage that marketing channel to drive app activity? So, we've been working directly with a number of our customers to help them use the app in more of a marketing campaign driven way, specifically using the push notification capabilities of the app to reach out and touch the customers at the right time, drag them back into the app and into the shopping experience, and ultimately get that customer to convert. Those are the two areas that we've seen the biggest overall growth in our customer base this year." McLandress also noted the increasing popularity of marketing features for small businesses to reach their loyal customer base via mobile. "In terms of trends, we've seen a lot of interest in better app marketing. Whether that means investing in sending push notifications, setting up beacon-enabled proximity campaigns, or better data tracking and analytics, we see that our customers are getting savvy with mobile marketing and want to get the most out of their investment. For this reason, we've started integrating with more robust third-party app marketing providers, like Urban Airship and Parse to name a few." Malyshev predicts that businesses will begin to invest more in app store optimization, increasing the app's visibility in the App Store and Google Play for customers to find. "I remember only about three to four years ago, all you needed to do to get top ranking for a certain keyword is to have that keyword be the name of the app. At that time, the App Store search algorithm gave too much weight to the app name, which made it an easy trick to getting more downloads. Now, however, the search algorithm is very complex. Everything matters now: name, keywords, description, screenshots, video preview, app icon, quantity of reviews, quality of reviews, and so on. With the search algorithm becoming more complex we also see more companies starting to offer App Store optimization services. Many companies, such as SearchMan, App Annie, Apptamin, Sensor Tower and others, have been created with sole purpose of optimizing your presence in the App Store and getting more downloads. I think that within this year we will see that App Store optimization will become a regular monthly expense for every app just like search engine optimization is now for websites." However, Anderson importantly notes that businesses should frame their thinking on mobile investment with a focus on increasing time, not necessarily monetary spend. "I think that one of the big misconceptions for mobile technology in general, is thinking only in terms of the money required for setup and deployment. However, if you're thinking in terms of time as spend, then absolutely we see an increase in time spent, as well we should. Our most successful customers are the ones who take their app seriously and who are taking the time to really engage with their customers via the app. The more essential mobile becomes, the more time it should necessarily take to invest in it." While many small businesses are still unsure about their need for a mobile app, most seem to understand the importance of a website. About 74 percent of small businesses have a website currently while approximately 9 percent reported that they planned to build one in coming years. What is important to consider, however, is the value of responsive websites that can be viewed and navigated easily from any device at any time. Of those with a website, only 56 percent of small businesses said their website is responsive. Most of the experts we interviewed said that having a responsive website should take first priority before thinking about having a mobile app. "If I talk to a small business owner, and I find out that they have a website but don't have a mobile website, but they're interested in getting an app, I immediately tell them they need to stop, and go back, and figure out the mobile website piece first. In my view, if you look at a traditional marketing funnel, mobile websites, just like your regular website, are very important for the awareness and the intent and maybe even the decision making process for a first-time buyer. It's a de facto requirement. The mobile app, on the other hand, is very important when you start to think about how you are going to nurture, leverage, and interact with your customers on an ongoing basis. So, I always encourage my customers to think of the mobile app as a channel to their most loyal customers, and to think of it as, 'These are your highest-value folks that have the ability, and have shown the desire to come back time and time again and interact with your brand. This is just one more channel by which they can do that. It's not, 'I need a mobile website or I need a mobile app.' We fundamentally believe you need both, and they both serve specific purposes in the buying process and in the marketing funnel, but there's also a logical progression that one needs to go through. I think that logical progression includes a must-have of a mobile website before you get to the mobile app piece of the equation." "What we've seen is that quite a lot of small businesses are using their Facebook page as their online presence. It's a very shallow experience for users; there's no functionality and there's no personalization. There's no ability to differentiate themselves and give themselves a competitive edge versus other players in the marketplace. That's why we developed a solution that incorporates a website as well an app, so a small business can update the two different things from the same CMS. That removes a lot of complexity, a lot of hassle, and it also gives the best experience for the consumer, because obviously the website looks great, and when they search for the website on their mobile phone, they can download the app free of charge as well." Are Wearable Apps "The Next Big Thing?" Next, we assessed the whether the latest app innovations – wearable apps – are something that small businesses are currently interested in. The results were pretty clear. Almost no one in the small business world is currently interested in building a wearable app. 76 percent stated they are unlikely to have a wearable app to market their business in the future. 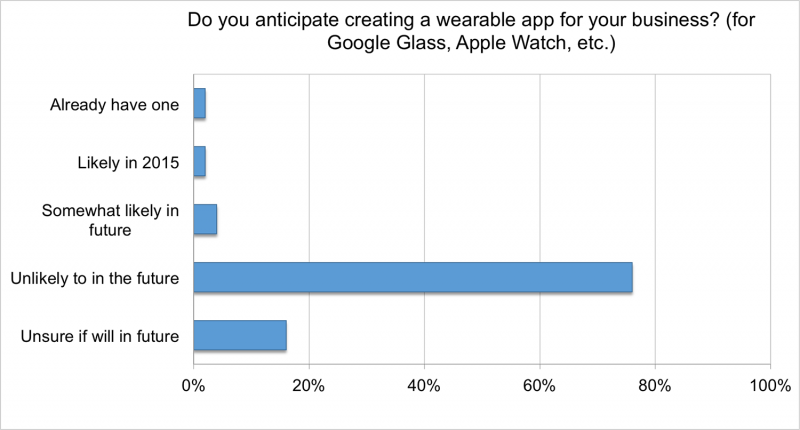 Another 16 percent are uncertain whether their business will have a wearable app. Gill thinks that these findings may not predict the future of wearable app technology. "I expect that number from 'unlikely to in the future' to drop pretty quickly during the next year or so. If you had done this survey in 2008 saying, 'Would you ever build a mobile app in the future? ', you'd probably get a similar result." Jones feels that small businesses are making smart decisions in staying away from wearables for now. "I think, in the future, that wearables will become a part of the mix but, at the moment, their penetration in the market is so low that it would be foolish, I think, to focus on that particular niche, rather than getting the basics right. Everyone's got a smartphone, everyone's got a tablet, so focus on that channel and getting that right, before you focus on wearables." Anderson expressed similar thoughts, advising that companies wait and see how the market plays out. "The tech alone is not the story. The story is how people figure out how to use it and how to make it work for them and their customers. Right now, wearable tech could be just another passing trend, or it could really change the way that we do business entirely. Until we see that play out a little more, it's impossible to know what its advantages are, and whether or not it's really worth it to pursue from a small business perspective." What we found in this survey is that small businesses have been slower to join the app revolution. However, experts feel strongly that apps are rapidly becoming one of the most ideal ways in which to communicate and interact with loyal consumers. Malyshev explained how apps are changing customer service forever. "Perhaps the greatest benefit of creating your own app is the elimination of the competition. Once a user downloads your app, however, he is almost forced to become a loyal customer. If a person uses your app, he sees no other competition. Not only that, but because apps are saved on the phone's home page users will see your logo every time they open their phone. This is very important because at the end of the day the goal of any business is to make all of your customers forget about any other company and only come to you." So, why aren't small businesses taking advantage? The issue seems to be a general perception on the part of small business owners that apps are difficult to build or maintain or that they are very expensive. Jaynes talked about these misconceptions. "The broad industry still has the perspective in their mind that having a native mobile app is an extremely costly endeavor. In addition, small business owners are faced with the time issue. 'Okay, you've got the price low enough, but do I have the time to invest and manage a mobile app in addition to my website?'" 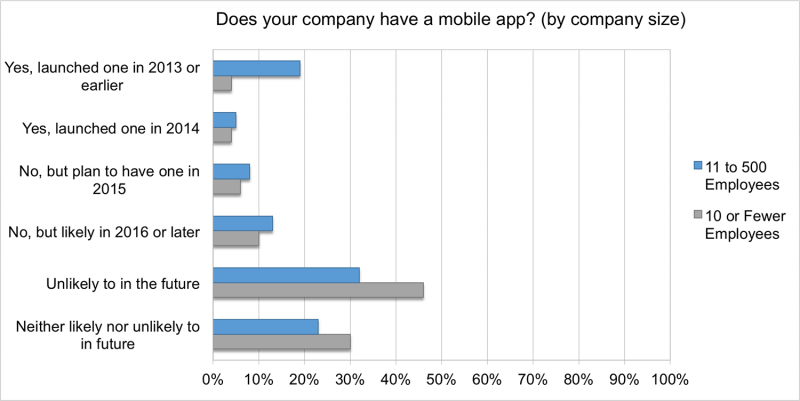 Despite these hesitations, overall our findings illustrate the building momentum for small business mobile apps. Although there is still some resistance and uncertainty from business owners about whether an app is right for their company, more options are emerging that make developing and maintaining an app for basic marketing and operational functions simple. Educational opportunities about marketing with apps should be geared toward small business owners so that they can be better informed of how they can benefit from apps and how affordable and easily maintained they can be.